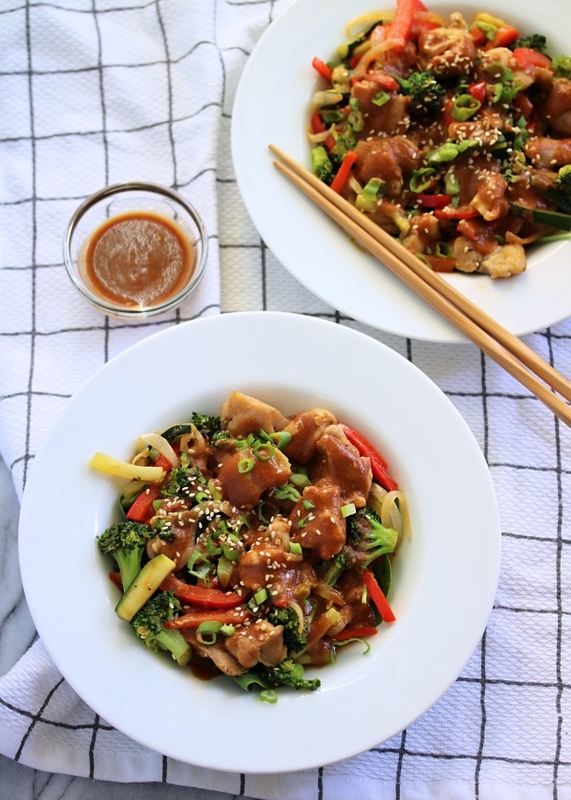 Stir fry is one of those things that I have made countless times over the years, but it always seemed too no-brainer to make it onto the blog. 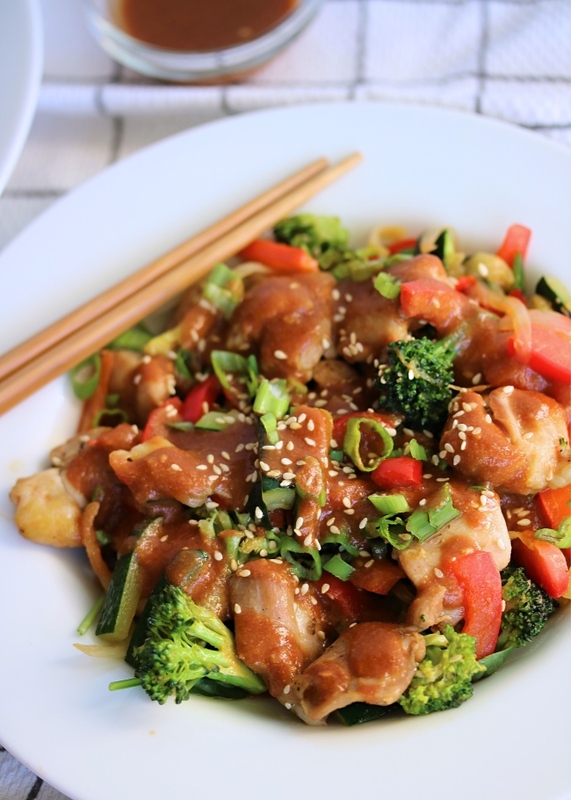 Fast forward to now, and this almost unbelievable sesame stir fry sauce, and the game has changed. 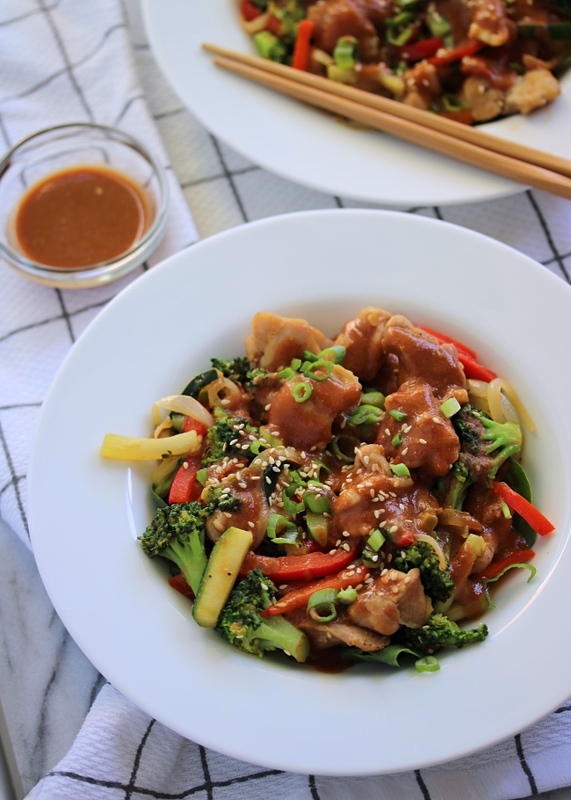 The sauce takes this dish from simple, homemade stir fry to better-than-a-restaurant flavor that I cannot get enough of! This stir fry starts off with chicken thighs from my ButcherBox. Have I mentioned what a lifesaver this monthly delivery has been?! I love going to Trader Joe's for most of our groceries, but am not a fan of their meat selection. Whole Foods is my favorite option for proteins, but any "extra" grocery store stops beyond the absolute necessary always seem to slide down my list of priorities and I get too busy to make it happen. Having my choice of top-quality chicken, beef, and pork cuts delivered right to my doorstep has been a serious win- and allows me to keep my other grocery shopping down to a one-stop-shop! Next up in this dish is the combination of avocado oil & ghee (you could also use coconut oil). There's something about the combo that fries up the chicken & veggies just right and adds savory flavor that I love. Of course this all comes together with the sauce. I blend in toasted sesame seeds which give this a thickened consistency and a delicious nutty flavor. These are sold pre-toasted at my local grocery store with the spices. I'll link to them on Amazon in the ingredients list below! They add so much to a dish and have become one of my favorite garnishes to keep on hand! 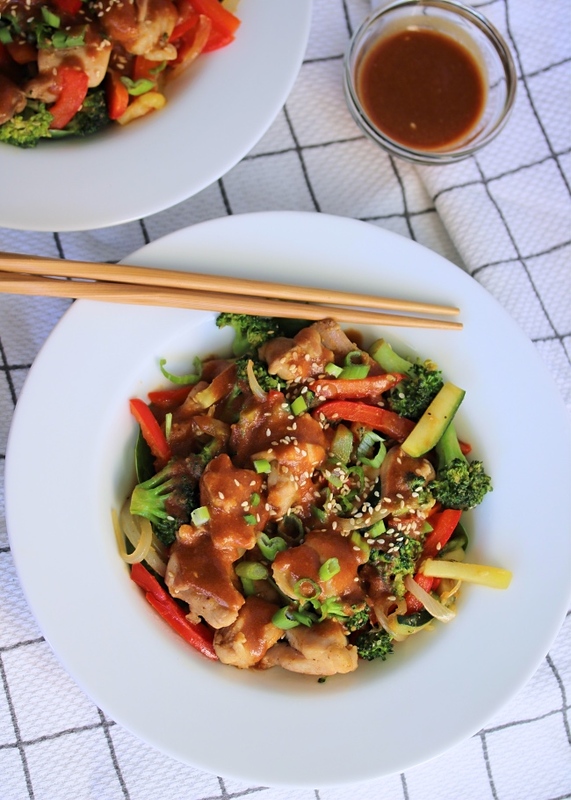 I hope you enjoy this stir fry as much as I do, and maybe consider making an extra batch of the sauce! It's that good! In a blender, pulse the sauce ingredients until smooth. Set aside. Heat the avocado oil in a large skillet or wok over medium high heat. Add the chicken, sautéing until all sides are lightly browned & the chicken is cooked through (about 7-8 minutes). Transfer the cooked chicken to a plate and set aside. Melt the coconut oil or ghee in the same skillet, and add the onion, zucchini, bell pepper, and broccoli. Cook, stirring occasionally, until as tender as you like, about 5 minutes. Stir the chicken back into the skillet, cooking for a few more minutes until warmed through. Stir in about 1/2 of the sauce, and save the other 1/2 to drizzle over the top at the end. 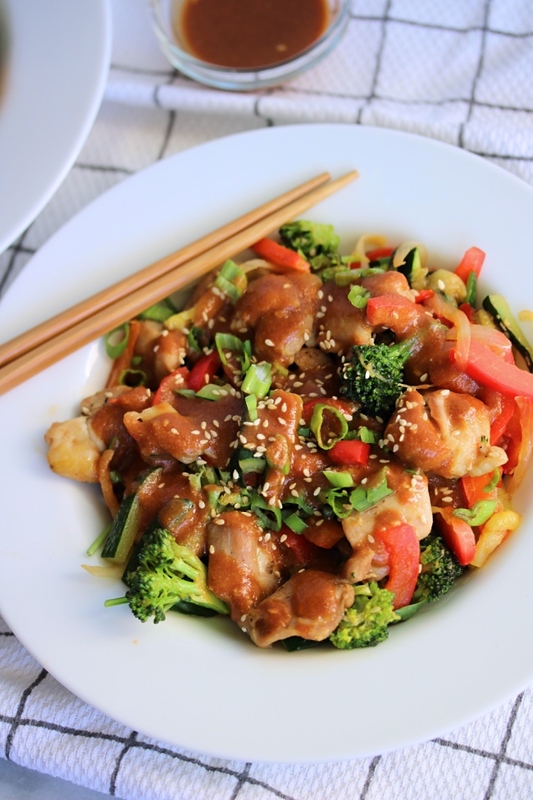 Serve hot with additional sauce drizzled over top, and sprinkled with sesame seeds & green onion to garnish. If you are making this dish on a Whole30, be sure to omit the honey. You really won't miss it! You can substitute chicken breast pieces or shrimp in place of the thighs, simply adjust the cooking time on step 2.
making this for the second time in two weeks, we love it! What a delicious dish! The sauce is amazing! I made it without honey and it tastes great! It also thickened easily without any starch that other recipes called for. Is there a substitute for the Dijon mustard?? I can’t find a compliant one.